Carrie found the yachting industry after graduating from Saint Mary’s College with a Finance Degree. Intrigued by the draws of working while traveling the world, Carrie started her yachting career in 2005 as a Stewardess. Eight years later, she worked her way up to Chief Stewardess on private and charter yachts in the Caribbean, the Mediterranean, New England and Alaska. 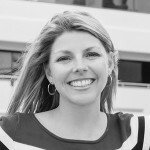 Carrie started off her career with IYC taking on the role of Sales and Charter Assistant to top consultant Mark Elliott and has been involved in the management of the company’s satellite offices in St Maarten and St Barths in the winter months, and Newport and Nantucket in the summer months. Carrie has now transitioned into a Charter Consultant with IYC. She and Mark have coined the phrase “Let’s Go Yachting!” and want to ensure all of their clients have a Legendary Experience onboard their luxury yacht. Her passion for yachting and her “been there, done that” experiences working on yachts are an added benefit she offers her charter and sales clients alike in creating personalized charter itineraries and cruising recommendations. When not at work, Carrie enjoys BBQing, playing cards, exploring interesting travel destinations (New Zealand this year!) and spending time with family.